Welcome to uFly. A huge airplane roars above us. Looking up, we wonder: how does it all work? What would it be like to be in the pilot’s seat? Wonder no more. uFly currently operates a flight simulator modeled after the B 777 -200ER. Welcome to one of the most sophisticated and realistic publicly available flight simulators in the world! Our B 777-200ER, or “triple” as it is affectionately known in the aviation community is the most meticulously detailed high performance airline transport category aircraft you will ever step into. From your first step, you will be overcome by its striking magnificence. Every inch expertly crafted to give you the most immersive experience possible. Created by real world aviation professionals with components taken straight from a real Airlines 777, it doesn’t get any more real. Featuring a fully-functional flight deck, the 777 is authentic aviation. For starters, every switch, knob and button has the exact same function as it does in the real airplane. From the “fasten seat belt” sign to the most complex entries into the flight computers, we’re ready to fly. Take your pick: cold and dark or powered up. Or customize your trip to the sky. 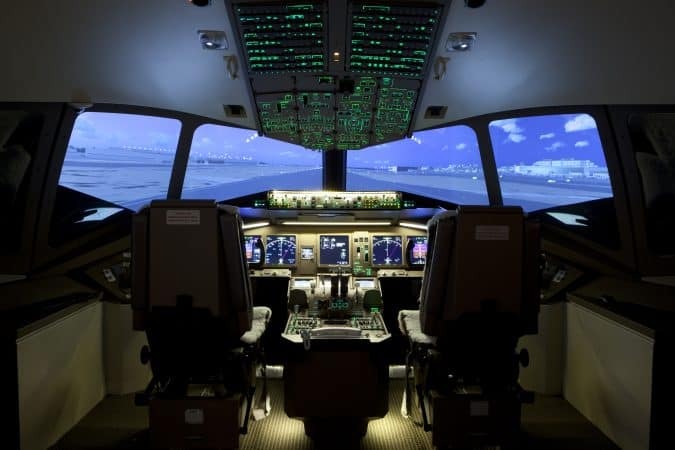 Whatever challenge or difficulty you desire, check out the extras: Fully functional Flight Management and Control Display Units (CDU’s). Worldwide database of airports, approach charts, taxi charts, SIDS, STARS, and most other real world charted procedures so you can fly the same laterally and vertically correct routes as your favorite airline! When we said authentic aviation, we meant it. Want to fly in a tranquil sunset in the South Pacific or stormy conditions in Toronto? Our powerful weather engine makes it happen. HD displays explode with enhanced scenery and air and ground traffic you’ll think you were there. Authentic aviation is what we’re all about. State of the art technology, equipment and training is just the start. Our passionate, knowledgeable and dedicated staff are professionals in the aviation industry and the flight simulator enthusiast community. Forget the frustration and disappointment from other flight simulators and experience the real deal. Welcome to a new day of authentic aviation.